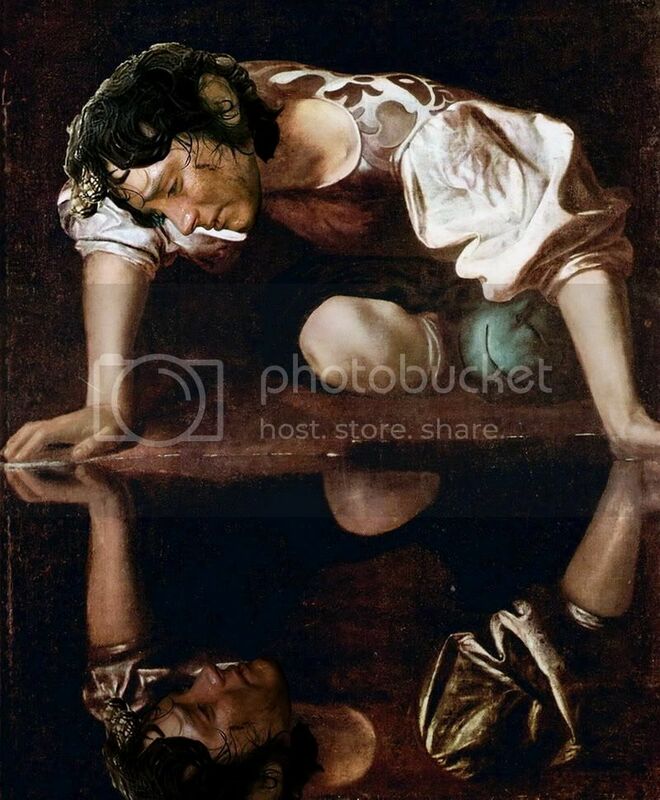 Frodo in Caravaggio's 'Narcissus’, with jan-u-wine's "Unbroken”. Warning: Long post, with many images, some quite large. A year ago, scrolling through Caravaggio paintings, I saved files of his “Narcissus” as soon as I saw it. I was sure I’d want to make a manip of it one day. That day has come. For this post, the discussion of the painting will come first, after which I will make a few reflections about Frodo in the finished manip. After the manip will come Jan-u-wine's poem, Unbroken, for which this manip was made. A "making of" section concludes the entry. Caravaggio's painting is one of the most well-known images of Narcissus in art. The myth of Narcissus survives in a few different versions. The synopses below come from the Narcissus entry in Wikipedia. Pausanias tells a tale in which Narcissus falls in love with his twin sister. When she dies, he pines away, becoming engrossed in his reflection in the water by the reed beds, because it looks so much like her. Pausanias tells another version that focuses on the more familiar theme of Narcissus: the story of a beautiful young man who spurns the love and desire of others, and dies as a result. Persons who held themselves aloof from love (and the common gene pool), were not looked on kindly by Aphrodite, or the Greeks. In that tale, Ameinias, one of the men in love with Narcissus, is rejected by the callous youth. Growing tired of his suitor’s affections, Narcissus sends him a gift of a sword. Ameinias kills himself with the sword, and, as he dies, calls down curses upon Narcissus. Later, Narcissus falls in love with his own reflection in a spring, and, in desperation, kills himself with the sword. In the Roman poet Ovid's version, Narcissus is the son of a river god who seduces a nymph. Worried about the child’s future, the nymph consults the seer, Tiresias. The child will live to an old age, the seer says, “as long as it does not look at itself”. As he grows up, many fall in love with the beautiful boy, but he rejects them all. The nymph Echo falls, too. She becomes so distraught, she withdraws into a lonely spot and fades until all that is left is her plaintive whisper. The goddess Nemesis hears the prayers of the rejected suitors and arranges for Narcissus to fall in love with his own reflection. At a pool in a reed bed, stooping to drink, he sees himself mirrored in the still water. He becomes so transfixed by the sight that he dies, unwilling to break the surface of the water to drink, since this would require destroying the image. As in Pausanias’ second version, a flower springs up in the reeds where Narcissus dies, after whom it is named. I have not found a scholar who says which version of the myth Caravaggio was illustrating in his painting, but I am guessing that since there is no sword in the picture, it is the one in which Narcissus falls in love with his reflection and dies of thirst rather than break apart his image. Understood at a deeper level, it’s a profound myth. 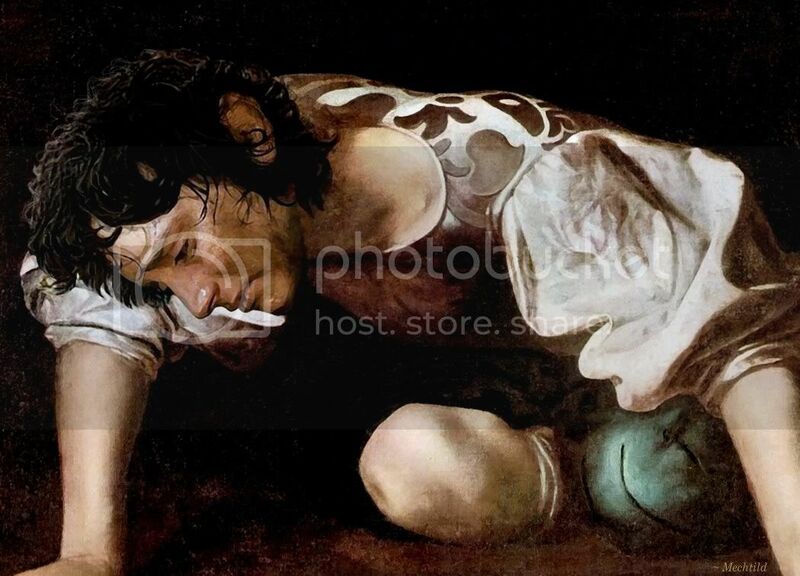 Caravaggio’s “Narcissus” (displayed at the Galleria Nazionale d'Arte Antica in Rome) was a challenge for me, not only because I had to put Frodo’s head and face into the painting twice, but because of odd aspects to the painting. The model appears to be Francesco “Cecco” Boneri, who appeared in“The Inspiration of St. Matthew”, “The Sacrifice of Isaac”, and ”Love Victorious". I hadn’t known it until doing the Caravaggio manips, but Caravaggio, unlike any of his contemporaries, did not apply paint to canvasses on which he had drawn preliminary sketches to guide his brush. X-rays of his canvases show no pencil work, just paint on canvas. He painted directly from life. The result is the characteristic vibrancy and immediacy of the likenesses, but also imperfections, especially in perspective. In “Narcissus”, the model’s head does not seem quite to match the neck in terms of fit. The head appears to be too small for the body, and the neck unnaturally long and stretched. Perhaps the modelling for the body was done at one time, and the head painted in later. Whatever the reason, the extra long, stretched neck increases, for me, an impression of yearning in Narcissus. The smallness of his head speaks of the smallness of his self-enclosed world, the whole painting moving about that small head with its slack, yet simultaneously entranced gaze. The open mouth conveys absorption, the mouth of someone so engrossed he is unaware his mouth has fallen open. With the myth in mind, the open mouth might betoken thirst. Perhaps it is both, the absorption in his image being the cause of the thirst. A more striking anomaly in the picture is the difference between the two halves of the painting, top and bottom. The Narcissus looking back does not match the Narcissus above. The head is smaller still, darker, and almost ugly, as if its features had been smeared, giving it a bestial, unformed look. The clothes don’t quite match, either. I wondered if this was a technical fault, the result of Caravaggio not using preliminary sketches. No critic I read mentioned it. I have decided it had to be an intentional artistic choice. Surely an artist as good as Caravaggio at painting from live models could paint a good mirror image of the top half of his own painting. Thus, if Narcissus sees in the still surface of the water a rather small, mean, muddied version of himself, it is meant to be significant, if in a subtle way (I didn’t notice the discrepancy at first). I wonder: did Caravaggio mean the lower Narcissus to show us the youth’s real self, or is the lower image meant to show what Narcissus saw: someone little and ugly and mean? The second reason would explain why Narcissus does not look at his reflection like someone in love, however transfixed he is, but like someone not particularly happy with what he sees. This is a very enigmatic painting to me. At first glance the impression is one of still tranquillity and, but the more I look at it, the more disturbing and provocative it is. Following from my remarks on “Narcissus”, above, I think this painting is an excellent one in which to feature Frodo, both aesthetically and in terms of meaning. It said in the myth, that the seer Teiresias told Narcissus’ mother that he would live to be old "as long as he never looked at himself". Or, as another translator said, "as long as he never knew himself." Was it life-threatening for Frodo to look at, to know, himself? In so far as he experienced himself after the Quest negatively, it would seem so. Part of the reason Frodo had difficulty going back to “normal” life, in my opinion, was positive, not negative. He had seen and known greatness: great spirits, great minds great deeds. He had known great suffering and horror, true, but also great goodness and beauty. He had gone where no hobbit had gone before, not even Bilbo, and had been changed by the experience. The change was good: he had been made a bigger person, inside. But the change made him less of a fit, back home. The Shire’s provincial ways might have been a comfort once, living life amid what seemed safe, cosy and familiar. Upon his return, Frodo might have experienced the Shire differently. If he had found the smallness of his neighbours’ minds discouraging and the narrowness of their concerns exasperating before he left (cf. his remarks to Gandalf in “The Shadow of the Past”), how much more might he feel this way upon his return? Yet his gain in stature was a good thing, however it might have set him apart from folk around him. "[Frodo] appears at first to have had no sense of guilt; he was restored to sanity and peace. But then he thought he had given his life in sacrifice: he expected to die very soon. But he did not, and one can observe the disquiet growing in him. Arwen was the first to observe the signs, and gave him her jewel for comfort, and thought of a way of healing him. * Slowly he fades ‘out of the picture’, saying and doing less and less. I think it is clear on reflection to an attentive reader that when his dark times came upon him and he was conscious of being ‘wounded by knife sting and tooth and a long burden’ it was not only nightmare memories of past horrors that afflicted him, but also unreasoning self-reproach: he saw himself and all that he had done as a broken failure. ‘Though I may come to the Shire, it will not seem the same, for I shall not be the same.’ That was actually a temptation out of the Dark, a last flicker of pride: desire to have returned as a ‘hero’, not content with being a mere instrument of good. And it was mixed with another temptation, blacker and yet (in a sense) more merited, for however that may be explained, he had not in fact cast away the Ring by a voluntary act: he was tempted to regret its destruction, and still to desire it. ‘It is gone for ever, and now all is dark and empty’, he said as he wakened from his sickness in 1420. "‘Alas! there are some wounds that cannot be wholly cured’, said Gandalf – not in Middle-earth. Frodo was sent or allowed to pass over Sea to heal him – if that could be done, before he died. He would have eventually to ‘pass away’: no mortal could, or can, abide for ever on earth, or within Time. So he went both to a purgatory and to a reward, for a while: a period of reflection and peace and a gaining of a truer understanding of his position in littleness and in greatness, spent still in Time amid the natural beauty of ‘Arda Unmarred’, the Earth unspoiled by evil. * I have always wondered if it wasn’t what her mother, Celebrian, went through, unable to recover her joy in life in Middle-earth, finally sailing to the Undying Lands, that enable Arwen to see this in Frodo. When I look at this manip, with Frodo gazing sadly at his dark reflection, what I see is his negative dwelling on his self-perceived failures, a vivid picture of him being subject to the “unreasoning self-reproach” Tolkien mentioned. Like Narcissus in the myth, he seems more and more unable to take his eyes from a vision of himself as a marred failure, unable to complete his task himself, and unable to stop regretting the loss of the Ring, the instrument of his torment. The more he looks, the more he feels bad, and the more he feels bad, the more he looks. The original painting is meant to show Narcissus looking at his reflection on the surface of the water. But the way Caravaggio painted it, with the mirror image in the bottom half of the painting clearly not matching the top half, the impression is that he is looking not at his reflection on the water, but through it, at another, submerged self. As I noted above, the face of Narcissus in the water is not a mirror-image, but a smaller, darker, more bestial version of the face above. In the manip, Frodo’s face in the reflection is made from the same image as the one above, but to finesse it into the painting I had to make it smaller and darker, which brought up red undertones lurking in the original. 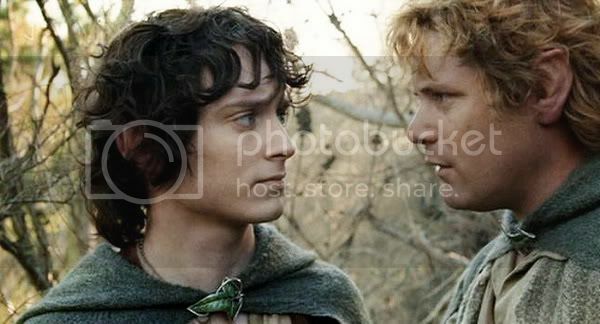 When I look at the finished manip, it looks almost as though Frodo is looking at himself in hell. He might as well be looking into the river Styx at a submerged Hades, or seeing his own sorrowful face in the Dead Marshes, like those fallen warriors of long ago. “All dead, all rotten”. The words of Gollum echo. Which is where Jan’s poem comes in. As dark as I see this piece, I did choose and make this manip with jan-u-wine’s poem, “Unbroken”, in mind. And I see her poem as a hopeful poem. So that I won’t give too much about the poem away before you read it, I’ll post my last remarks below the poem. The file I worked from for this manip is so large (2024 x 2454 pixels, 14.2 MB) it is too big for Photobucket, so I can’t give it to you with a link. If anyone would like a copy for the purposes of making a print (the bigger the file the better quality the print), or just staring at, please email me. My email address is on my User Info page. I can send the file to you as an attachment. To get an idea of the manip’s real size, I made the long, narrow image directly below from a full-size crop of the image, cut to Photobucket’s size limit. Click here to this detail shot at full size.. Be sure to open it up all the way, using Photobucket’s little button for full-size. from the small sanctuary of my hand. that stay upon the river-bottom. since I visited the dark bank of the river. Those things grieve me even more. I chose Caravaggio’s Narcissus for “Unbroken” because it showed the subject gazing into the water, which I thought would convey the image of Frodo standing, stooping, or sitting by the Anduin to secretly drop in his chain, wishing it away, yet mourning the loss that letting it go made all the more real. But the more I have worked on the manip, the more profound I have found the connection between them and the poem. Frodo, like the chain, "threaded evil". He was "shielded by grave beauty". And, in spite of all the evil he bore, he survived, and was "beautiful still". ...which, finally, is the depth of heart and mind of God. Or, if you prefer, Eru. When Frodo looks and sees himself at last—his full self—unlike Narcisssus, he will not die, but live. For those who like this sort of thing, I made the manip in my usual way, although, with double faces, it was a bit more laborious. After choosing a face and supplemental hair elements, I tweaked the painting for better contrast and sharpness, then began to apply the elements in layers, tweaking each in turn for a match in colour and brightness, until I got them into final position. I then saved the moveable png document to a jpg, for the final blending process. Using primarily the clone tool at various settings I did the brushwork for blending the face into the painting, erasing bad bits of hair and drawing in more, correcting collars and diminishing the cuts on his face. I decided to keep the dirt, which heightened the sense of pathos to me. After all the tweaking and finessing was finished, using the selection tools, I applied filters to better match the photographic elements to the painting. I did many versions, liking many of the effects very much (all of them applied moderately). But, for the sake of posting, I forced myself to choose two. “Eggshell crackle” enhances the watery mood nicely, with its soft dappled bits of light. “Painting: Dry Brush” accentuates the chiaroscuro, which accentuates the drama. ~ Caravaggio: 'The Cardsharps', plus jan-u-wine's "The Wager", 1-21-08. ~ Caravaggio's 'The Lute Player' (includes the most about Caravaggio), 10/30/06. ~ Caravaggio's 'The Fortune Teller', 4/14/06. ~ Frodo Art Travesty LJ entries (entries that present selected manips, which may feature notes on the paintings and manip techniques, as well as essays or poems). Ooooooh, Mech, what a heartbreaking picture. It's terrible to see Frodo suffer with the Ring, but in some ways it's worse to see him after the Quest in this state. Grieving, despising himself, wounded... my sweet baby. :( Send him to Tol Eressea, quick. I'm glad you are pleased, Luthien! There are so many ways this could have gone. What a post - I'm blown away. You are so right in saying that Caravaggio's painting is not very moving. It's a riddle... and just looking at the black and white contrasts, it reminds me almost of a Rorschach test picture. Very odd. I think it's a reflection on reflection. 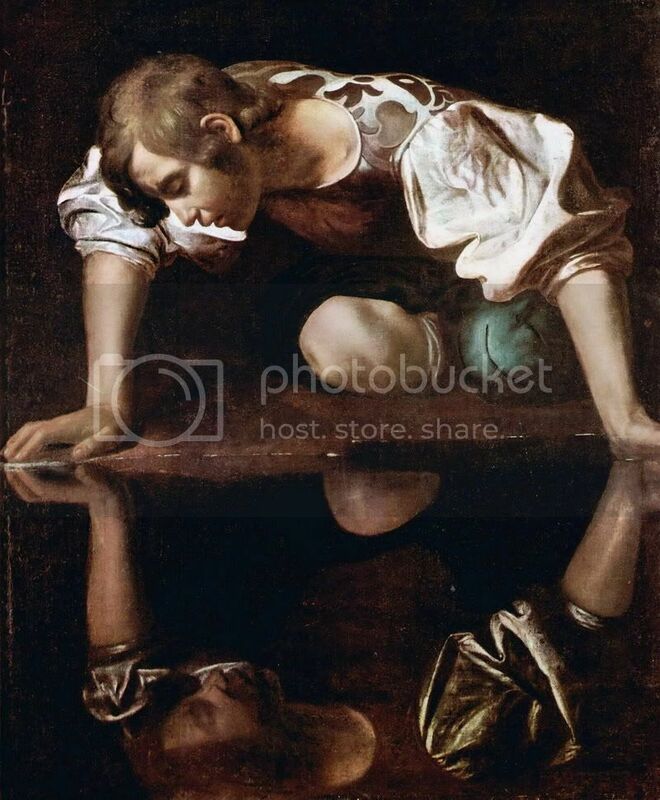 Caravaggio's Narcissus does not appear as an individual to me, but as the personification of the human need to recognise oneself by looking into a mirror (self-knowledge); it's more of an archetypical nature in my view. With Frodo as protagonist, the beholder is suddenly concerned on a personal level and feels involved, and it's almost too painful to witness his agony. Such intensity! 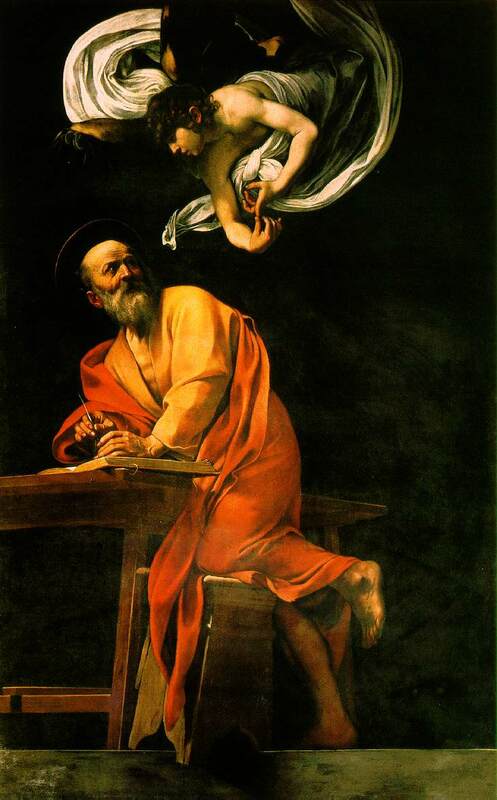 I have to come back and read Jan's poem later... but my, you, Jan and Caravaggio are a helluva team!! It's incredibly moving! I love what you said about the original painting being archetypical, a personification (of the need for self-knowledge). It does seem a remarkably non-specific portrait for him. Usually the faces he produces are very distinct individuals. Perhaps part of Narcissus' condition is that he's not fully-formed as an individual, locked into self-absorption. It's such an interesting painting. Thanks for posting, Whiteling! I've only yet read part of the entry, but wanted to quickly comment. I literally gasped when I saw the image come up on my friends list. It stabbed me in the heart, with beauty and with sorrow. BEautiful job. I've read half. I'll come back later. I love the Caravagios you've done. Brilliant work, fitting to Frodo. Gosh, Alyon, thank you! 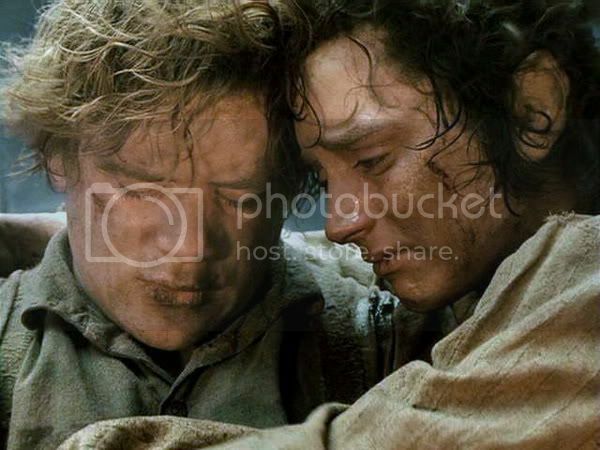 It did turn out to be a very poignant image, thanks to "End of All Things" Frodo. Thank you, Mews. I am so pleased the manip and poem works for you! ohhhhhh! Your manip is so utterly breathtaking! It so fits Frodo and his anguish and I just can't stop staring at it. I feel like my comment just doesn't do your work justice and wish you could know how it makes me feel when I look at, how utterly in awe I am of your talents! The Art of Fic, you are so good to say all this. :) Thank you so much! I love the way this came out. I think film Frodo and Caravaggio make beautiful [and soulful and moving] visual music together. Ooooh, this is gorgeous and it speaks to me in more ways than just one. Firstly, it is a stunning manip with Frodo's expression different from the Narcissus one but more moving, I feel, since the emotion seems to run deeper. Narcissus looks more interested, which is not what you could call Frodo's look. Oh, Frodosweetstuff, that is the COOLEST album cover! I don't know a thing about the band, but what a great piece of graphic design! 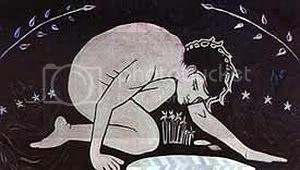 You're right, the image from Jean Cockteau's 'Orphee' is very like a painting for the Narcissus myth. I am so glad you liked the manip, for I know you are an artist yourself. Another wonderful poem from Jan-u-wine. I don't recall the chain being mentioned again after the Ring went into the fire, but that Frodo would let it go ~ when he couldn't give up the evil thing that once encircled it ~ is profound. '... if he but knew it.' Yes ~ he breaks my heart. By the way, I had saved your earlier versions of this manip, Mechtild, having wandered in here late last night, but with no time to comment. So now I have both sets! I do prefer Frodo's hair in the revised images, now that you point it out, but I marvelled at the original too ~ one of your very best works, IMO. Up there with my all-time favourite, Chatterton! Blossom, what a thrill to hear from you! I'm so glad you thought the face was a good choice. I tried several, but this one was the *clear* favourite. Mariole! Hello! Thanks for stopping in. I'm so glad you enjoyed the "behind the manip". It's all so very rich and fascinating and deserves a thorough read and subsequent reflection... and the risk is that there's not enough time. At least not right away. And that's how come I haven't commented before now. It's a stunning manip, and so filled with layers of meaning. It's gorgeous and sorrowful and very angsty all at once - a psychological study in manip form! Everything, inclusive of the poem, fills out the picture, as it were. This post was a great read, and the manip certainly makes considerable impact. Thank you! Maeglian, thanks for commenting so generously. I got quite engrossed in this one. The more I worked on the post, writing it, and the more I worked on the painting, thinking of it all the while in relation to Jan's poem, the more involved I became. I always had liked the look of this painting, but had never given it real attention until using it for this manip. I love it when an art work--whether it's visual art, music or writing--never stops giving of itself. You can look and listen and read such works over and over again, and there's always something else to think about, some subtly different palette of emotions the thoughts provoke. P.S. I love the way your image looks as an icon. It reads beautifully, even at such a small scale. I wonder if I might use it myself? What an amazing coincidence! I've had this icon for ages, and I never used it. I remember I iconized the painting because it reminded me strongly of Frodo; it was a undefined feeling, though, so I can't thank you enough for expressing it so clearly and eloquently, and for reminding me, once again, the reasons why I love Frodo so much. It's so beautiful... I'm speechless! It's a fortunate coincidence, then. Perhaps a lot of us fans who have seen this painting have thought of Frodo? Caravaggio in general evokes his image, but this painting is so introspective, it begs for a connection to be made. I'm so glad you got to see this post, Bagma, since it was posted during what was for you the Horrible Week. Thanks for the beautiful, generous remarks, too. Speaking of making connections with the painting, wasn't the poem an uncanny "connector"? I must remember to tell Jan to come and look at your comment. She is not on LJ and doesn't get notifications of reply. I don't know what to say. I am taken aback by the beauty and angst of your manip, Mechling, and Jan's poetry. Oooh, Este! I was beginning to worry that you'd either missed this post or just didn't like it, poem or image. Thanks so much for commenting. They turned out really well, I thought--the way they go together. I find it incredibly satisfying when Jan's pieces are enhanced by the images; her texts always make the images--whether manips or screencaps--more interesting and more meaningful. P.S. Our new snow finally melted again. Now it's grey, chilly and rainy. I hope this means the REAL beginning of spring! Thank you, White Gull. I'm glad you appreciated the work done on the manip. I hadn't meant to imply that Frodo was a "Narcissus", White Gull, at least not in the traditional sense of a cold, heartless young man who refuses to love anyone but himself. I did not write clearly enough, to have given that impression. I merely thought that Caravaggio's illustration of the myth--which is so much more evocative and ambivalent than the version of the story I quoted above (about the vain young man who gets his come-uppance)--leant itself well to an image of Frodo contemplating his own inner demons. That Frodo had a dark image of himself after the Quest, which grew darker after he got back to the Shire, was what I meant him to be looking at in the water, giving him that sorrow that is in his face. I didn't mean for the manip to project an image of Frodo in love with himself, like Narcissus in the myth. Quite the opposite! Mechtild, if you are not an art critic or teacher, you certainly could be. I love the sympathetic way you draw us into the world of the painting by comparing the mythologies behind its inspiration and of the artist's approach, and how you share your own emotional responses to it. Your reasons for choosing this painting as the basis to illustrate jan-u-wine's poem definitely enhanced my appreciation of both. Your manip skills are really second to none and if it was not sacrilege I would suggest that you are improving on the original, in the digital realm. Is that due to Frolijah's great beauty compared to the (probably intentional) wasted and anaemic appearance of the original figure? Or the already strong resonance of the character of Frodo in our perceptions? Maybe a little of each is involved. But I think that you have an amazing talent for recognizing opportunities for the perfect integration of these images. I was about to say 'complementary images' but 'contrasting' may be better, as part of the wonder of these manips is the re-interpretation of mood and meaning they provoke. One cannot hold water within one's hand. Is that how Frodo now sees his fragile vision of self, spilling out helplessly from his broken grasp? that stay upon the river-bottom." I see here the Ring's last lure, the temptation to suicide. Water is the opposite of Fire and the "still eye of the Anduin" must seem to Frodo the very opposite of the 'wheel of Fire', the naked eye. The fulfillment of a great endeavor, however it ends, can be an empty experience and Frodo's sense of meaninglessness is heartbreaking. Does even the chain itself, forged by the Elves, imbued with their protective blessings, 'desire' the evil it once held? Or is it a mere projection of Frodo's sense of perpetual loss? Does he refer to his maimed finger, or is the 'empty space' the mocking absence of the Ring? There is almost a sense of grim humor, the 'old Frodo', in his referring to the chain meeting a "careless end". No one could care more, or show more care, in its eventual destiny. I like that Frodo commits the chain to the Anduin in a kind of heroic funeral which echoes that of Boromir. Boromir was held a friend and champion, despite his moral lapse under the Ring's power, and perhaps Frodo's act here is a step towards recognizing that no moral blame attaches to his ultimate seduction by the Ring, that all parts in the Fellowship were worthy of honor. It is characteristic that his 'rite' should be humble and solitary, on the dark bank of the river at night. He does not wash the blood from the chain, but commits it with its stain for the river to wash clean in its time. And perhaps after all it was a dream, a symbolically prophetic one, as Frodo's dreams have always been. The chain lies broken but the river is unbroken, flowing forever to the Sea. Although irretrievably altered in mind and body, Frodo's 'unchaining' is a symbolic release prior to his eventual journey across the Sea and towards serenity. Another extremely beautiful and thought-provoking poem, jan-u-wine. The last two stanzas have such an ache of longing. They remind me of those First World War poems, with soldiers longing for home. Thank you both, Mechtild and Jan-u-wine! What a great partnership and how lucky we are to share your work. "And perhaps after all it was a dream, a symbolically prophetic one, as Frodo's dreams have always been. The chain lies broken but the river is unbroken, flowing forever to the Sea. Although irretrievably altered in mind and body, Frodo's 'unchaining' is a symbolic release prior to his eventual journey across the Sea and towards serenity." Frodo might not have been able to will himself to let go of the Ring at the Crack of Doom, but he wills himself to let go of its chain. I think this is a tremendously meaningful act--meaningful for him, and for us readers. What brilliant use Jan makes of this conceit, this little incident that might have been. Your thoughtful analogy of Frodo and Narcissus is very compelling. 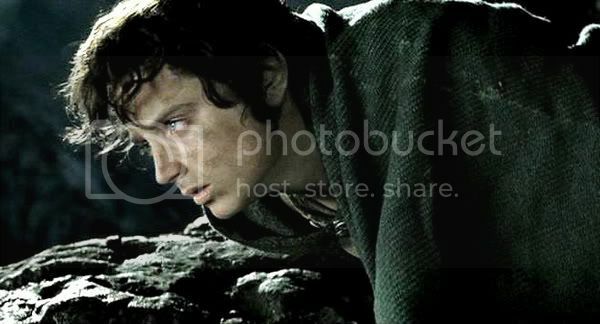 (and I have to add I agree with the thought of Arwen and Celebrian) I will always find this part of Frodo the most heartbreaking, that no one could reach him, and this manip captures that sense of lost Frodo so well. Hi, Cat! I'm sorry to have taken so long. I am back from a trip and am starting to go through the mail. I am so glad this manip succeeded for you. It might be my favourite at this point as well. To think I started out making these as tongue-in-cheek art pin-ups of Frodo, just for fun. They have turned into serious things, many of them, images that become windows into aspects of his character. I think the pairing of the manips with Jan's poems contributed to that. Her perspective on Frodo can wear a smile, a very loving one, and can even be sensual on the very rare occasion, but it is never silly, or "naughty". Just as her poems invite readers to look at Frodo with greater depth, making manips to complement them has produced Art Travesties that invite readers to do the same, but visually.